Electronic auctions have the charm of games of chance. If you’re lucky, you’ll get what you need for a good price, or you can sell something that’s worthless to you. However, deals by auction function ideally in ‘ a serious environment where there are enough participants. One of the most popular electronic auctions, it focuses mainly on supply and demand on the part of individuals. For example, if you have a spare mobile phone and aren’t sure what it’s worth, an auction can help you. 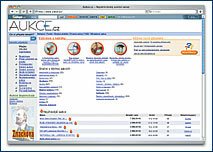 The “most traded” items on aukce.cz are mobile phones, computers, and electronics. And there’s a chance that some of the 30,000 registered visitors will react to an offer. The auctions are free of charge, and the site is based on the eBay.com concept. Trader integrity is governed by both public ratings (by customers) and a black list of unreliable partners. An interesting project – fine art and antiques on auction – which has been imperfectly executed. That’s a shame, because the Art Consulting gallery, with offices in Prague and Brno, has been active on the market since the nineties. 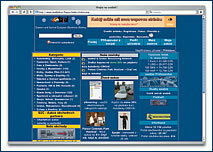 Its internet catalog is well laid out, with pictures of the items. On-line auctions supplement classic virtual auctions. Unfortunately, there is no way to search or view a listing according to the number of bids. Additionally, the site’s programmer forgot to install a link to return a visitor to the introductory page, and the format is not optimized for all monitor screen sizes. So sometimes you can’t see the entire page. Only links to auctions that are organized by professional auctioneers. This involves mainly real estate and larger movable property, such as cars. Reports on auctions are updated regularly and well ordered. When you click on an item, a separate window appears showing the auction’s organizer, contact information, and a description of the item or building. The site also includes auction news and a database of auctioneers and appraisers. This specialized auction site handles outstanding debts. Other services provided by this web site include offers of assets (real estate, equipment, etc.) for direct purchase – i.e., at set prices. The site is well arranged and invites serious browsing, thanks to its security, among other things The fact that the content “moves” very slowly is an unpleasant surprise. The last auctions took place several months ago, but the site still shows banners for an already completed direct offer. It even shows a lathe that was put into the system in 2000. After registering, a customer can participate in auctions as either buyer or seller for free. There are charges for extended or assisted inclusion of goods in an auction (see the “ceník” link). The site’s graphics are of professional quality, and it’s easy for a visitor to find his way around, thanks to a good Help section. The seriousness of offers and demands is assured by publicly accessible ratings. The main offer are for small items and gifts (corporate auctions were not active at the time of this review). One disadvantage of this site is the small number of bids. 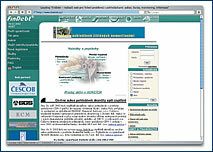 The official site for the National Program for Computer Literacy – a state-subsidized project aimed at organizing computer training around the entire Czech Republic. Mainly for absolute beginners who are wary of modern technology. The operator B3net offers SMS advertisement distribution to a database of 750,000 mobile phone numbers. Renting the numbers is allegedly legal, due to a contract with the Personal Information Protection Authority. T-Mobile canceled its free SMS messages for non-clients in February. Immediately afterwards, several web sites appeared on the Czech market that allow such messaging: levnesms.cz, mysms.cz, mobilem.cz, and sms.cz. Prices for messages are CZK 1.15-1.50 each. Sending SMS messages to all networks costs money when you use mysms.cz or mobilem.cz. The service can be accessed following simple registration and a deposit payment to the operator’s bank account . – Very soon it will be possible to put all three parts of The Lord of the Rings or four James Bond movies on a single CD. The maximum capacity of an ordinary DVD is thus increased from about two hours to thirteen – thanks to recording via a blue-violet laser instead of the standard red one. The so-called Blu-ray disk was developed by an association of firms that includes Matsushita and Sony. The association released licenses for the technology for sale in the middle of February, and the new products, (both the disks and the electronics) should be available before Christmas. The Blu-ray disk will still be twelve centimeters across, and it can be overwritten.